Zeitoun knows nothing about what Kathy and Raleigh are doing, and he can only hope that the missionary and Homeland Security followed through. After lunch he is brought to a small cinderblock room, a makeshift courthouse. A young man introduces himself to Zeitoun as the public defender. Zeitoun immediately begins to explain his case and asks to call his wife. The defender tells him that this is just a hearing to set bail, not to be judged. While his wife has been busy trying to get him freed, Zeitoun can only continue to trust and have faith in God as well as in the few people who have promised to call Kathy as he’d asked. This is the first time Zeitoun gets some kind of court hearing, although in this case it doesn’t seem to be a positive development. The charges against Zeitoun, for possession of stolen property, are read aloud, and the prosecutor suggests setting bail at $150,000. The public defender counters with $35,000, and the judge sets the bail at $75,000: then it’s over. Zeitoun again asks for a phone call, asking why they should set bail when no one knows he’s in prison. He gets no answer. The public defender is most likely overwhelmed with cases in the aftermath of Katrina, but for the individual case of Zeitoun, it seems especially irrational and absurd to have a bail hearing without anyone who could pay the bail knowing about it..
Baena, Victoria. "Zeitoun Part 4: Monday September 26." LitCharts. LitCharts LLC, 27 Jan 2016. Web. 22 Apr 2019. Baena, Victoria. "Zeitoun Part 4: Monday September 26." LitCharts LLC, January 27, 2016. 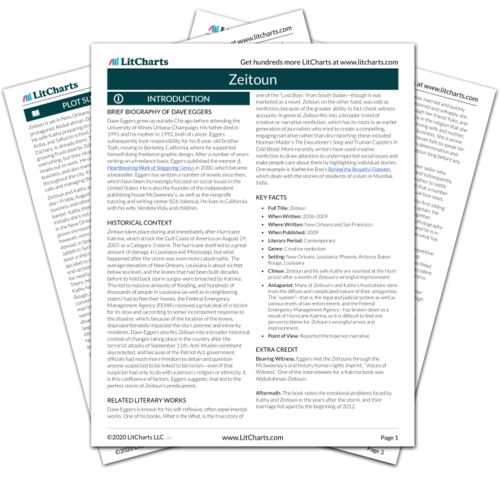 Retrieved April 22, 2019. https://www.litcharts.com/lit/zeitoun/part-4-monday-september-26.